The Console view displays the output of the utilities invoked when building a project or the programs output when running/debugging. Expand C/C++ and Build, then click Console. To display information on the latest build only, select the Always clear console before building check box. 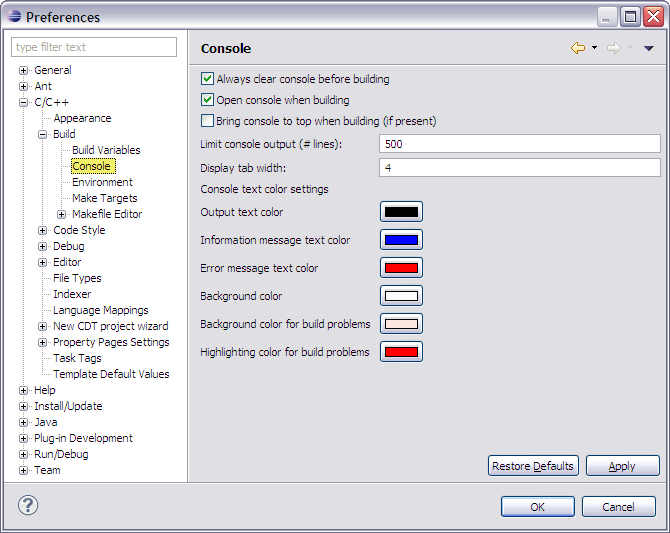 To open the Console view when a project is built, select the Open console when building check box. To display the console if it is already open when a project is built, select the Bring console to top when building (if present) check box. To change the number of lines the console stores in its history, enter a new value in the text field next to Limit console output (#lines). To change the number of spaces displayed by a tab, enter the number in the txt field next to Display tab width. To customize the colors used in the Console view, click a color control and select the new color.